PRE ORDERS - ALL ORDERS MUST BE IN BY 30 JUNE. PRODUCTION BEGINS ON 1 JULY. Artwork services offered are usually printed on paper, cut with some sort of laser and installed between the case and the plexi. 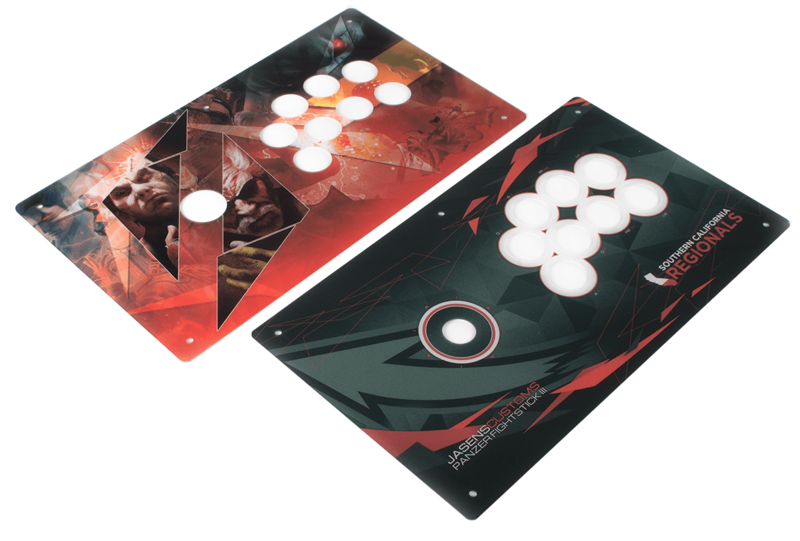 Generally this method is inexpensive and easy to do while providing a simple way to swap artwork on your Panzer Fight Stick later. The downside to artwork printed this way is it is susceptible to humidity or duty/debris getting between the plexi and artwork when installed. 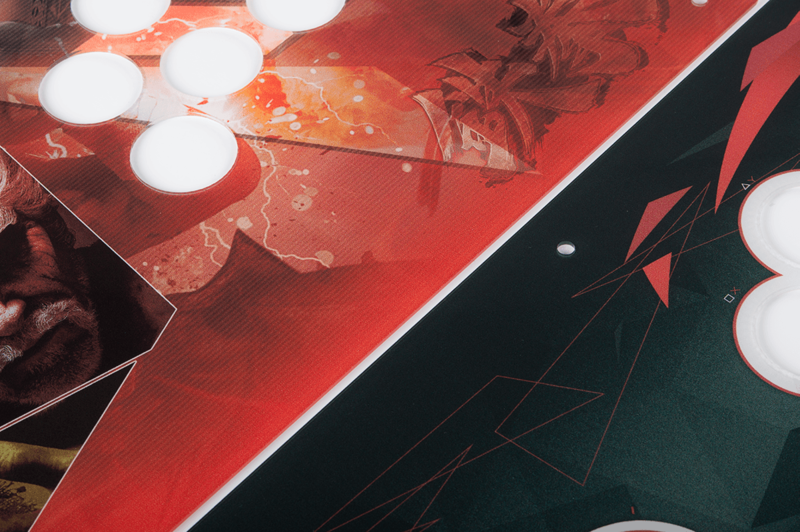 In 2016 we played with direct print on plexi artwork for LI Joe's custom Panzer Fight Stick and it came out awesome; it was so awesome that we later printed some Tekken 7 inspired artwork for a personal build as well as some SCR artwork for a Panzer Fight Stick 3 featured during SCR2017 (shown above). While this method is not the cheapest it does have an awesome clean look that can't be matched when installed. Use the MCZ TE2/TE2+ art template provided below in CMYK mode at 300DPI. Your artwork will only look as good as the file you provide. Artwork must be submitted via DROPBOX (link provided within 24-48 hours of order) and named with your ORDER NUMBER, i.e. AB2111.PSD by 30 JUN 2018. If not, yours will be CANCELLED. Once the order period is over all artwork will be sent to the lab for printing and cutting. Each plexi will be shipped in its own box with padding to ensure it arrives safely. 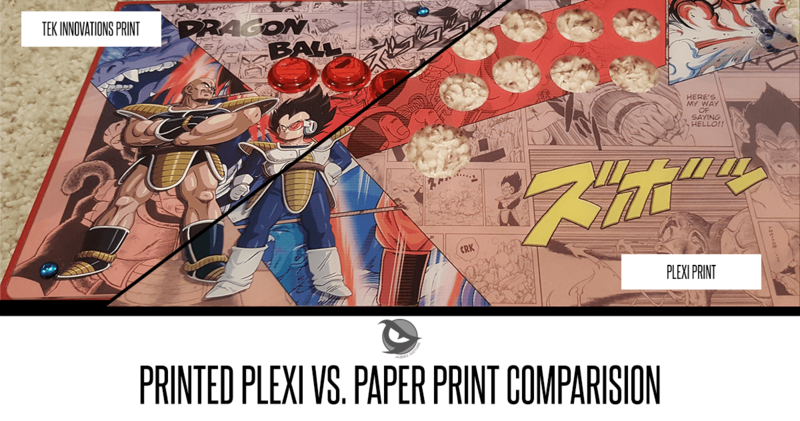 Paper printing is VERY DIFFERENT than plexi printing. White points are different, materials are different, etc. What you print at home or with TEK-INNOVATIONS using the same file WILL LOOK DIFFERENT on printed plexi. Printed plexi is typically BRIGHTER/LIGHTER. The Printer used is a high end machine and calibrated with a BRIGHT PROFILE. This means, you should darken your artwork up a little bit if you want deeper colors. Aka, adjust your brightness/contrast before submission. WE DO NOT PROCESS ANY IMAGES YOU PROVIDE. This means, I am taking your PSD file and layering it with the cut files used by the computer ONLY. You may think your monitor is calibrated and showing you the best image for graphics design. More often than not, this is not true. Proper calibration requires expensive hardware that most users do not have. What you see on the screen is NOT what you will get with a printed image. Photographers use IPS monitors with routine calibration updates to ensure the most accurate picture, but monitor manufacturers calibrate their screens (especially gaming ones) to look bright and present the best screen image possible. There is NO REFUNDS and NO REPRINTS if you are unhappy with the final product. These are too expensive and time consuming to do to offer refunds. It's best to set up your artwork and be meticulous ahead of time to avoid disappointment.